← Congratulations Week 07-29-13 Giveaway Winner! Hello, my name is J. Morgan and I’m addicted to reading. Which is probably why I became a writer. The stories just didn’t come fast enough, and truthfully I needed to burn off some of that overactive imagination. Said imagination soon developed little voices telling me all about their lives, which led me to writing. Being from a small town in Louisiana, I get to call myself eccentric instead of crazy that way. Don’t you just love how Southerners get creative with labeling themselves? So I guess you could call me just your run of the mill Eccentric Southern writer. How’s that for truth in labeling? I think I can trace it all back to when I was a child. Suffering a bad case of pneumonia when I was six, I spent a lot of time in bed learning how to breath again. During that time, I had two forms of entertainment, comic books and tv. Since in those days we only had two channels, I did a lot of reading. My imagination was fueled by those stories and pretty soon I was making up some of my own. My action figures went on wonderful adventures as a result. Fast forward thirty years, and I took all that and started putting my stories down on paper, or a computer screen rather. I write mainly paranormal comedies. Though lately, I’ve decided to branch out. Taking my love of all things comic bookish, I’ve began writing a Young Adult series about a teenager who suddenly finds himself a superhero. Since I’ve never officially grown up, I think it is a perfect fit. I absolutely love the initial burst of coming up with a story. All the characters talking to me about their lives just gives me a thrill I can’t describe. When you throw in all the possible story ideas, it’s like my head is going to explode stories all over the place. That is the greatest rush of being a writer. Writer’s block! It isn’t that I can’t write. No, it’s when all the possible roads I can go down jumble up in my head that gives me trouble. Usually this all takes place somewhere around the middle of the book, and I spend weeks agonizing over where to go, or what to do. As soon as my brain figures it out, that first rush comes flooding back. Before I know it, I have a finished book in my hand. Well, finished, unless you count the hours of polishing it up. All over the place! I honestly can’t tell you where they come from. I guess life would be the closest I could come to answering that. Crawl out of bed. Do my eight hours of duty to pay the bills. Then come home, play with my friends and write. Rinse and repeat daily. Yeah, that about sums it up. The middle bits. Honestly, once you understand your characters, the rest falls into place. It’s not about conflict. Conflict is easy. It’s understanding how your hero and heroine will react to the heck you put them through that is the key to writing. At least, it is to me. I actually have two books coming up. The first is a re-release of a book that I went into and revamped to fit into my Love Bites universe. How Wicked Can She Go? is the book that gave me an inkling of what creating my own world was all about. Now, I get to give it the place it deserves in my Vampire and Werewolf laden insanity. The second is the seventh book in my Vampire series or Book Two in the second stanza of their story. Bite the Neck that Loves You literally sets the stage for the dark times in my epic tale of vampires, ancient myths and comedy. Dark Times and Comedy? You have to laugh sometimes to stop from crying, and believe me there’s going to be a lot to laugh about. BE SURE TO COME BACK to read more about J. MORGAN and his novel, SCROLLS OF ETERNITY: REBIRTH, on Wednesday’s Karen’s Killer Book Bench!! Happy Reading! 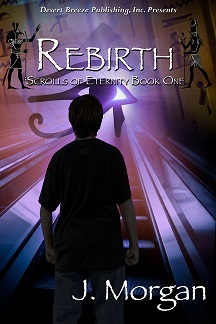 **SPECIAL ANNOUNCEMENT: J. Morgan will give away a copy of his release, SCROLLS OF ETERNITY: REBIRTH, to one of his lucky readers who comments on either his Monday Interview or Wednesday Book Bench blogs!! Winner will be randomly selected and announced Monday, August 19, 2013. Thanks, J., for sharing your stories with us! Clicking on your links, J. Morgan, I came upon Were Love Blooms. Read the prolog and loved it! I actually thought you were a female. Great snarky voice you have. 🙂 Added Were Love Blooms to my wish. Thank you for introducing J. Morgan to me, Karen! Except I started making up things to act out even before illness, J certainly describes how a writer starts a story! Sorry about the Writer’s Block. I don’t recall ever having a bout of that. I may stop writing, but that is only to sort out what is going on in my head from the characters either going silent or too many to make sense of anything. Tweeted for you! Thanks for stopping by and commenting, Mari. Thanks, too, for the tweet! Happy Monday! Thanks for stopping by Gerri and Mari. Gerri, glad you enjoyed Were Love Blooms. I’m actually doing double duty on that series now. Working on the print edits for Were Love Blooms and working on book three in the series, Were Love Finds You. I hope to have it finished in time for release before RT next year. Mari, I think the more ideas you have on a book, the harder it is to get over the hump. By the middle of a book, I literally have so many ideas hitting me on where to take my characters, I can’t decide which one to pick.